Cat Works as Security Officer in a Philippine Bank - 2NGAW! Believe it or not! There’s a cat working as security officer at a branch of the Development Bank of the Philippines (DBP). 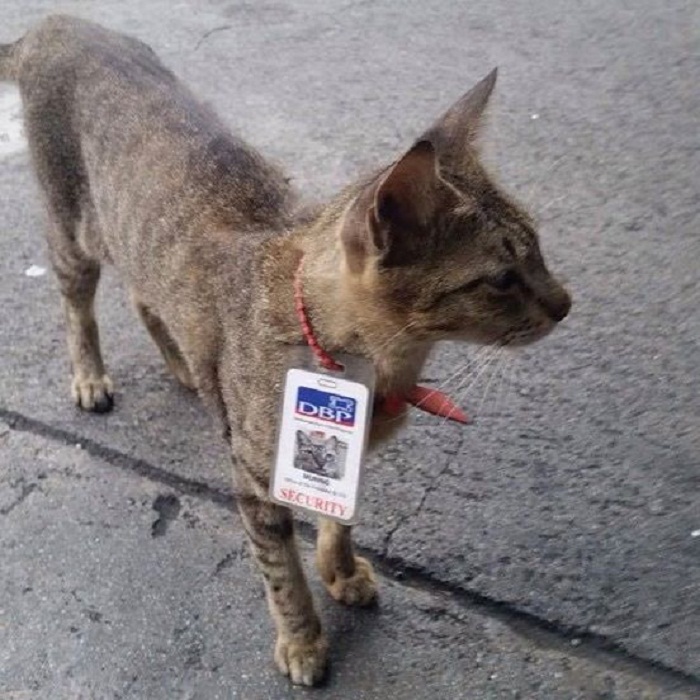 It seems that this cat, nicknamed “Muning”, is a legitimate employee because it even has a photo ID around its neck, clearly identifying it as one of the bank’s security officers! It is cool how the bank’s staff has a great sense of humor – clearly shown by their readiness to “employ” the cat and give it a legitimate ID. Perhaps this one is truly a valuable asset, making sure that the bank is free from rats and vermin. We’re wondering what Muning is getting on the payroll; perhaps a delicious fish at the end of the day or a can of cat food for breakfast? Hmmmmm. Si Muning may trabaho, ikaw meron? (Muning has a job; do you have one?) :)) High five to the Development Bank of the Philippines main office who’s apparently hired a valuable asset in their company. Word goes around that “Muning” catches so many rats, mukhang sinali na siya sa payroll (it appears that the cat is already included in the payroll)! Ang cute! (smile emoticon) ‪#‎adoptdontshop ‪#‎puspinsrock! Note: Not my photo, just saw this being shared around animal groups. What do you think of Muning? Some netizens believe the cat is underfed and should, instead, be rewarded handsomely by the bank for taking care of its rat problems. However, there are those who jokingly point out that a well-fed Muning just might not have the appetite to go after those rats. Though based on personal experience, well-fed cats still catch rats, actually. The difference is that a hungry cat might eat the rat but a well-fed cat will simply catch and kill it. Jeweled Flower Mantis: The Cutest Insect?